Timely diagnostic identification is critical in managing plant pest incursions. Diagnostic capacity is needed to support surveillance programs and to assist development of risk mitigation and pest control or eradication arrangements. Given the large number of identified emergency plant pests, it is important that work on these pests is nationally coordinated to ensure expertise is available when required, that diagnosis is timely and consistent, and that duplication is avoided. PHA has already developed a list of the diagnostic status of all of Australia’s 348 high priority pests, as identified in PHA’s industry biosecurity plans and PHA’s Pest Information Document Database (PIDD). PHA was also part of a collaboration to develop a Plant Biosecurity Toolbox that provides detailed, web-based diagnostic information to assist with the rapid identification of exotic plant pests and diseases in the event of an incursion. 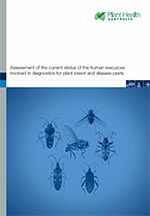 The National Plant Biosecurity Diagnostic Strategy was prepared by the National Plant Biosecurity Diagnostic Network and launched at the second Annual Diagnostician’s Workshop in February 2013. 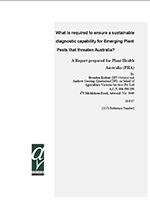 Presents the views of diagnosticians surveyed and provides critical baseline data from diagnostic laboratories from around Australia on the annual resources required to maintain a diagnostic manual for a plant pest or disease. This report presents summarised results from a web based questionnaire that was circulated to government, university and private diagnostic centres across Australia. It considers the capability to diagnose insect and disease pests of agriculture and forestry in Australia. Broader environmental issues relating to native flora, which are also important, are not considered in depth.